iMeter uses advantages of computer digital e-meters and adds a number of new features, which were not used in e-meter building before, but they directly flow out of the advantages of digital technologies. We tried to get rid of anything unnecessary we could get rid of: e-meter case, cables from e-meter to computer and from e-meter to solo can, and left only things we could not get rid of: solo can, e-meter board and wireless connection between e-meter and computer. Thus, the only logical variant remained - to put e-meter board inside solo can and leave only solo can alone, being the e-meter. To our opinion this is the optimum and most user friendly way of e-meter realization, which keeps the traditional can electrode for taking reads from the person’s palm. We didn't take into consideration other possible electrodes types, as we are followers of standard tech and established practiсes. The only minus of such a solution is a bit heavier weight of the can with e-meter and battary inside, compared to empty can, but as we are speaking about the iMeter weight of around 120 gram - the average smartphone weight - we think that this additional weight can be neglected. On the other hand it gives a lot of advantages. No more annoying cables and disconnecting contacts, preparing iMeter to work takes a second - just push the "on" button. Finally a wonderful mobility is achieved - you can audit anywhere, just take the can in hand and put your smartphone in front of you. Cafe, train, park - all the world is open for your auditing. So, iMeter is a digital computer wireless e-meter built-in inside solo can, which works via bluetooth and if needed via USB cable. The second can is connected to the main solo can through a connector on the bottom side. When connected, the two electrodes of the solo can are merged into one electrode and become the first can, while the additional can is connected as the second can. 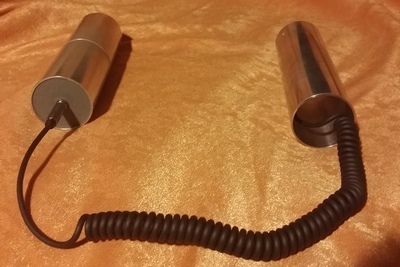 The second can is connected with a short spring spiral cable which stretches when the distance between cans is increased. This is a comfortable way which does not restrain the preclear movements. The iMeter works with computers, notebooks, tablets and smartphones with the following OS: Windows (all versions since XP including Windows 10), Mac OSX (10.7 and above), Android (3.x and above). Unfortunately iMeter does not and will not support in the nearest future Apple iOS: iPads, iPhones and iPods. This is due to the strict policy of Apple, which forbids to connect non-authorized bluetooth devices to iOS. We are trying to make iMeter available on jailbreak i-devices but it is not made yet. For its work iMeter program needs the computer graphics card driver to support OpenGL. Most of modern graphic cards have drivers supporting OpenGL already installed. Sometimes older cards don't support OpenGL or don't have OpenGL drivers installed. In this case you have to download and install newer drivers with OpenGL support on the site of you computer vendor or graphic chip producer - Nvidia, Ati, Intel. The iMeter uses a modern high quality bluetooth module providing reliable and stopless iMeter connection to computer devices in any can position on a distance up to 10 meters. More than a year of tests of more than 50 users have not shown problems with the connection reliability on majority of devices of trusted brands. On some devices of not so well know and mainly Chinese manufactures there can be problems with connection due to poor quality of bluetooth chip installed. The cans are made of aluminium covered with a tin coating of 30-50 microns thick. This thickness is enough for the solo can to serve for quite a long time. A layer of this kind and thickness allows to make a spare polish of the can. Even if the coating wears off, underneath it is the aluminium case, which is also an allowable can material according to LRH. Can replacement is also a simple act - turn off 2 screws, take out the cap with the iMeter board from the can, disconnect the internal connector - and the device is ready to be installed into a new can. iMeter has a built in battery of 600 mAh which provides 15-20 hours of non-stop work of the device. When auditing 2 hours a day, the device can work for more than a week from one charging. 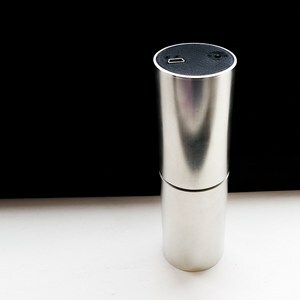 A battery of this type does not make the device too heavy, the iMeter weighs around 120 gram. On the upper cap of the device there are: power button, two leds and a miniUSB connector, through which the iMeter can be connected to a desktop computer. This can be done e.g. if your computer does not have a bluetooth module. The iMeter is also charged through this miniUSB connector. This can be done with any smartphone charger with miniUSB connector, as well as with the included charger. But bear in mind that smartphone charges are usually of high quality and quite expensive, so it is more preferable to charge iMeter with smartphone charger than with a less expensive one included in the pack. The one included is also OK, but who knows with these noname Chinese chargers..)) The included charger is more like the emergancy charger for those who don't have a smartphone. The second can is connected through the mini Jack connector situated on the bottom of iMeter. The iMeter has two indicators - work led and charging led. The work led flashes when the device is powered but not connected to the PC and not sending data to the program. When the program connects to the iMeter and receives data from the device, the work indicator shines without flashing. 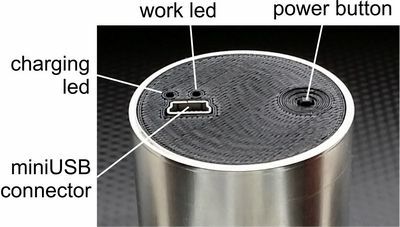 The work led color shows the remaining battery charge – if it is green, the battery is almost full, if orange, it is less than half full, if red, it is almost empty, charge is left for 1-2 hours of work and the device should be charged soon. The charging led shines while the device is charging. If the battery is not charged, its color is red, when charging is close to finishing, its color becomes orange, and when charging is complete, its color becomes green. Program installation: on Windows on Mac OSX, on Android. iMeter connecting to computer via bluetooth: on Windows on Mac OSX, on Android. iMeter connecting to computer via USB cable: on Windows on Mac OSX. Download the archive with the program from this site, unzip it to any place on your PC or notebook, and "iMeter" folder appears in this directory. To start the iMeter program double click on the iMeter-x.x file inside this iMeter folder. Download the archive with the program from this site to any place on your computer, unpack the archive, after that the application with our logo icon appears in the same folder with the archive. To start the program double click this icon. You can move this application file to any place on your drive (for example to Application folder) and start it from there. See below how to connect iMeter device to the program. The easiest way is to install the program from Google Play. Open Google Play app on your Android device, type iMeter in the search line, in the list of the found apps you will see our red logotype, tap it to proceed to the iMeter app page and there click "Install". Another variant is to install the program from our site i-meter.ru/en. From the site you can also install previous versions of the program. Open our site from your mobile device you would like to install the program on, and download the program apk (e.g. “iMeter 2.0.apk”) from the site to your device. After download is complete, tap on the downloaded file, begin and follow the installation. During the installation Android might tell you that you don't have the permission to install applications from non-authorized sources and point you to the settings menu to change it. Check the item "Unknown sources: allow installing applications from sources other than Play Market" and continue installation. You can go to the Main settings menu/Security settings yourself and check this item, then you can begin the installation once again if it was stopped. After installation is complete, an iMeter icon with our logo will appear in your applications. You can move it to one of your screens for easier access. To start the program, tap on the applicaton icon. Besides program installation you have to connect the device to your computer, notebook or mobile via bluetooth. This pairing is done with the standard means of each of the three operating systems. If you don't know how to do it, watch educational videos on youtube or our video instruction above. While connecting, the system might ask you to confirm the code sent to the device, this is OK, confirm it. If you cannot connect the device with the automatic code (this is possible on older Mac OSX versions, for example), choose the option "insert code manually" and type in the code "1234". On Windows, a bluetooth device is installed on a new com-port (communication port - a kind of a channel which the device sends data through) with a number (ex. COM26), and it will appear in the OS. You can see the installed com-ports in the Control Panel/System/Device manager in "Com and LPT ports" section. You can pay attention and remember com-port number which iMeter device is installed on during bluetooth pairing. After iMeter is paired in Windows, go to the iMeter program "Settings" menu in the upper right corner of the program window. Go to the "Other sett." plate and choose from the drop-down list the right device com-port in the "Choose device port" section. After this is done, click the OK button and this port will be saved. After that click the “connect” button in the upper left corner and allow for a couple of seconds to connect. If needle is moving, everything is OK, if not, try to choose a different com-port in the drop-down list until you find the right port, on which program connects to iMeter and needle is moving. You have to choose COM-port just once, after that each time you start the program it will automatically connect to this port and thus to the iMeter and receive data from it. Every time program starts up it tries to connect to iMeter device on the selected and saved com-port, if the iMeter is powered off at program start up, it will not find it and will not connect. In this case you can power on the iMeter by pressing the power button and connect it manually by clicking the "Connect" button in the upper left corner of the program main window. Or you can shut down the program and start it again and it will connect to iMeter on start up. On Mac OSX, the device will be installed on a com port with the name something like "iMeter-AMP-SPP", thus the right port in the program is usually choosen automatically. And when you start the program it will automatically connect to the iMeter. If this is not the case, just choose the port named "iMeter-AMP-SPP" in the drop down list as explained above. Click OK and the port will be saved. Afterwards the program will always connect to this port on start up or when "Connect" button is clicked. In Android, after you installed the program and paired the iMeter, you just switch on bluetooth and iMeter and start the program. It will connect to the iMeter automatically. You can also use the connect/disconnect button in the upper left corner to connect or disconnect the device. For this, in Windows you will have to download a USB port driver from our site and install it. Unzip the archive with the driver. In the unzipped folder you will see 2 files – drivers for 32 and 64 bit versions of Windows. Install the file corresponding to your OS. To learn which OS you have – 32 or 64 bit - watch educational videos on youtube or our video instructions above. After installing the driver you can connect the iMeter to your PC with a miniUSB - USB cable (included). Connect and switch on iMeter or visa versa. The OS will install the device on a new com-port. You can see all installed com-ports in Control Panel/System/Device Manager in the "Com and LPT ports" section. The needed port will have the name something like STMicroelectronics Virtual COM Port (COM26), remember COM26. Go to iMeter program Settings (click Settings button in the upper right corner of the program, below Time), go to the "Other Sett." plate and choose this port "COM26", for example, in the drop down list in the "Choose device port" section, click OK. Now the program will automatically connect to this port either on start up or when "Connect" button is clicked manually in the upper left corner of the program window. In Mac OSX you don't need any drivers. Connect the iMeter by USB cable, OS will install the device automatically. After it is installed choose the right port in iMeter program Settings, as described above. It will have the name something like "usbmodem<number>". Contact us by e-mail indicated on the site. Your OS is not supported, check the supported OS list above. The program needs graphics card OpenGL driver to work, some older computers have drivers or graphics card without OpenGL support. So you should try to install a newer driver with OpenGL support, or a newer graphics card. This can happen also due to viruses in your OS, which destroyed some system files. If you have old computer and haven't reinstalled your OS (Windows for example) for many years, this can be a possible case. This shows that your graphic card driver doesn't support OpenGL, which is needed for program to work. 90% of graphic cards have newer drivers with OpenGL support, so please download newer driver from the site of your graphic card chip manufacturer (Intel, Ati, Nvidia) and install it. Read or watch device connection instruction and try again. If it doesn't help, ask some computer enthusiast or specialist to help you, if it also doesn't bring to a result, connect us by e-mail. Device worked, the needle was moving, but then it stoped working, needle is not moving, no connection to device. 1) Check if the device is switched off. 2) Click "Connect" button in the upper left corner of program window or close it and start again. The program will again establish connection to the device, if it was lost for example due to device was switched off. 3) I doesn't help, restart the device (switch it off and then on again). Sometimes after restarting the device OS can have failure to recognise it, usually it can happen if you restard device, connected to computer, several times in a short period of time. Another restart usually solves this problem. 4) Eject and insert again USB cable if device is connected by USB. 5) Restart bluetooth module in PC or mobile. It should solve the problem if it is caused by failure in bluetooth module. 6) Restart PC or mobile. Will solve if the cause of problem is bluetooth module or Windows or Android OS failure. 7) Delete iMeter from the list of bluetooth devices and re-connect it again. 8) Delete and re-install USB driver for Windows. Using the last two quite radical methods (reinstalling device in the OS) is a very rare ocasion, but this happened in my practise a couple of times during development. Sometimes Windows connection settings are damaged due to some Windows failures and so on. This should mainly happen due to often installations and deinstallations of device, which are needed during development and testing. The most widespread case is failure #3, which is solved with device restart. Bluetooth connection is poor and not stable, deviсe disconnects periodically. Bad needle reaction, when it seal and doesn't react normally is caused by poor bluetooth connection. This is due to poor bluetooth module installed in your desktop or mobile. Usually it happens with not well known chinese brands. Most devices of well known brands are equiped with good and modern bluetooth modules which allow the device to work well on a distance of up to 10-15 meters. You can check the quality of your bluetooth module by checking how far from your PC or mobile iMeter can work. If this distance is considerable and iMeter works well at least 5-7 meters away from your tablet for example, you can be sure that it will work perfectly OK on its usual usage distance of 1 meter. You need to solve problems with monitor/graphics card vertical syncronisation, possibly with the help of computer specialist. For example some programs recording screen video can change sync settings and bring to such situation. After stopping this program and restating PC, the settings should come to normal. I ancounted this effect, when using screen video regording program. On some of its settings such programs insert changes in PC sync and timings and cause the mentioned effect along with screen desyncronization and the needle gaps. Possibly some other programs can insert such sync settings changes. After PC restart in my case the settings returned to normal and the effects disappeared. This is not possible if the device is not damaged, as it doesn't need calibration. The action principle of modern ADC (anolog-digital converters) is based on continuous self calibration, each measurement is achived in the process of ADC calibrating itself unless is signal is equal to the signal of measured object. Thats why measurements can not go away from the right ones during usage. If TA shown is really wrong, then the cause of it most likely is the defective cable connectiong device plate and the solo-can. You can check if TA is right very easily - just buy in any electronics shop a 1% resistor for 5 or 12,5 kOhm, and then close two halfs of the solo-can with this resistor (pay attention not to hold it with a naked hand or it will show the resistance of your body also - do it through some isolator - a piece of paper, etc.). The program should show TA 2 or 3, plus-minus (resistor inaccuracy can be 1% or even 5%, if it is 5% the differene can be up to 0.15 TA). If it so, then device shows perfectly right TA and you can use it. If TA differs from this value for more than 0.15 TA for 5% resistor or 0,03 TA for 1% resistor, you need to contact us to remove this defect of the cable contact. Other Contact us by e-mail shown on the site.